I remember the exact the moment it clicked together for me. It was about half an hour into episode 2 (directed by Josef Kubota Wladyka) of Narcos: Mexico on Netflix. The camera crept across the dry, desert landscape toward a hole in the ground, where Rafael Caro Quintero (a.k.a. Rafa, played by Tenoch Huerta Mejía) was digging furiously, in an attempt create a makeshift aqueduct to help grow his field of marijuana. It recalled images from the earlier sections of Paul Thomas Anderson's masterpiece There Will Be Blood, when Daniel Plainview (played by Daniel Day-Lewis) was digging for oil underneath the rocky ground. 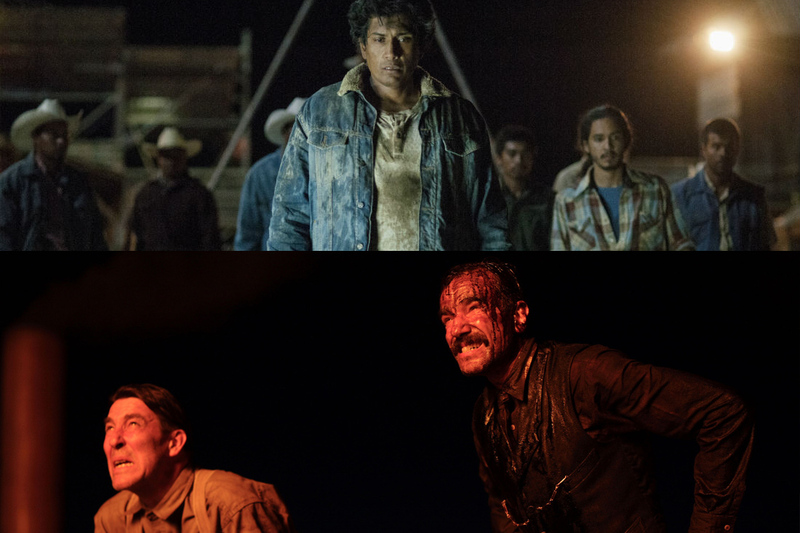 Then, as I continued to watch Narcos: Mexico, a more striking visual parallel to There Will Be Blood began to emerge. For example, as Rafa and his boss Miguel Ángel Félix Gallardo (played by Diego Luna) continued to grow their lucrative weed empire, their operations expanded to communities of workers (as seen by Michael Peña's character Kiki Camarena in the episode directed by Andrés Baiz); it's similar to Plainview's promise of new communities to his oil workers. By the end of that episode, a common thread between two works was established. The moving images say everything. Much like There Will Blood, Narcos: Mexico tells a similar story of being on the frontier of prosperity -- and the dark undercurrents of what happens when greed overshadows ambition and passion. By the time Narcos: Mexico nears its end (in an episode directed by Alonso Ruizpalacios), Gallardo finds himself in similar footing to Plainview, resorting to primal violence to establish dominance and reign (although it's an ashtray in place of a bowling pin). Because of these striking side-by-side moving images, one could see the tragic arc come into form: first there was drive...then discovery...then decadence...and finally downfall.